Plant-based and vegan meals, aren’t just for Veganuary! Try swapping out just one meal a week for something plant-based and enjoy the health benefits. Opt for nutritious and delicious recipes that will naturally supply you with more fibre as you build dishes on wholefood ingredients such as vegetables, legumes, nuts and whole grains. For this satisfying, flavour packed, plant-based noodle dish, you’ll create a simple but delicious cashew nut butter as the sauce. Brimming with vegetables and whole wheat noodles, it feels comforting yet deliciously wholesome and very quick and easy! Meanwhile, boil a kettle and peel and finely dice the carrot and courgette. Slice the mushrooms and onions finely and grate or chop the garlic. Once hot, add the diced carrot, diced courgette, sliced onion, sliced mushrooms and half of the chopped garlic with a pinch of salt. Cook for 10-15 min or until they’re starting to caramelise. Meanwhile, add the wholewheat noodles to a pot of boiled water with a pinch of salt(enough to cover them) over high heat and cook for 5 mins or until they’re tender. Once cooked, reserve a cup of noodle water, then drain and rinse the noodles under cold water before returning them to the pot. Next, blitz or grind 3/4 of the cooled cashews coarsely. Add the honey, remaining chopped garlic, 3 tbsp olive oil and a large pinch of salt. Add 3 tbsp of the reserved noodle water and blitz or grind into creamy nut butter. Meanwhile, chop the coriander finely, including the stalks and chop the remaining cashews coarsely. 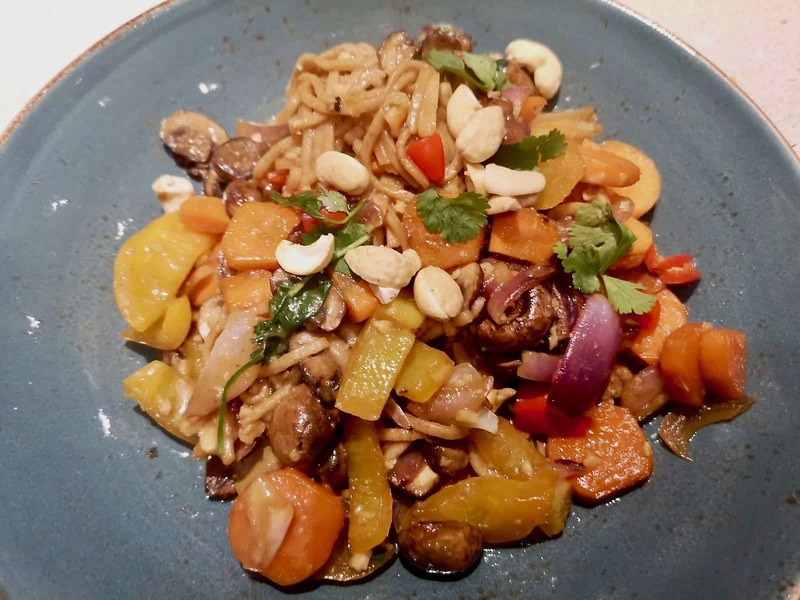 Once the vegetables are caramelised, add the cooked, drained noodles with the cashew nut butter, tamari and half of the chopped coriander (save the rest for garnish!). I add a squeeze of fresh lime for extra OOMPH!